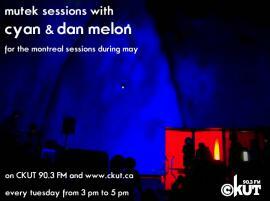 May’s Montreal Sessions are brought to you by Cyan and Dan Melon! We’re calling it MUTEK SESSIONS because the two will be focusing on the programming of this year’s MUTEK festival. Expect rad guests and music selected by two folks with excellent ear for the best in electronica every Tuesday in May from 3-5pm. UPDATE: First guest was Patti Schmidt! Check out the archive. UPDATE #2: MUTEK Sessions, part deux: an on-air hang out with Marie Davidson! Check out the Music blog for details.